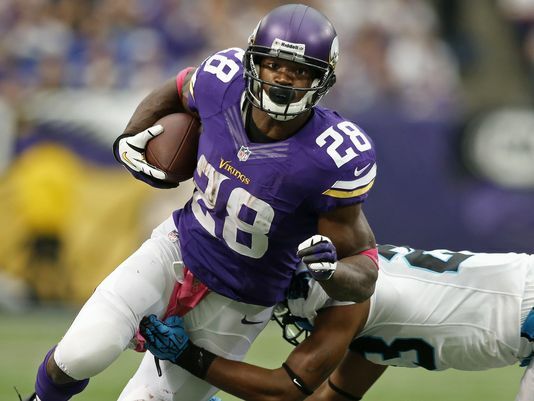 Vikings running back Adrian Peterson says he’s at 80%. There’s a long way to go until the season starts and no one should doubt AP’s ability to recover from his groin injury but he’s also 29 and will have to break down at some point. Be cautious. Eli Manning should be back to 100% before the season starts but is entering a make-or-break year in fantasy and real life. The Giants added running back Rashad Jennings and will probably add more targets during the draft. With recent indications that the Bucs will draft a quarterback early, its assumed that Mike Glennon is not long for Tampa. Although as someone pointed out, it’s not like Glennon had a bad rookie year. This entry was posted in Daily Update and tagged adrian peterson, eli manning, mike glennon, rashad jennings. Bookmark the permalink.